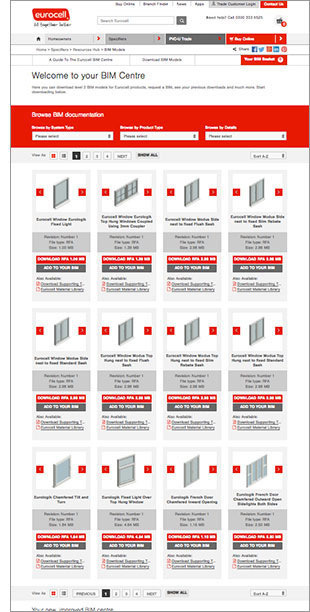 Eurocell – the UK’s leading manufacturer, distributor and recycler of window, door, conservatory and roofline products – has reimagined the way designers and specifiers access its BIM models. The result is the BIM Centre, where finding and downloading the right BIM models is quick and fast, and updates are delivered automatically. Users can sign up free to the BIM Centre in a matter of minutes and then use Eurocell’s new search and filter tool to find the models they need. Rather than downloading models one-by-one, they all go into a BIM basket to be downloaded en masse at the end of the process. The models downloaded by each user will also be stored in a personalised BIM Library for quick and easy access at a later date. And by signing up for automated updates, BIM Centre members will receive an email to let them know when models have changed. If specifiers can’t find the model they need, the BIM Centre has a simple ‘Request a BIM’ function which will be handled by Eurocell’s technical support team – who will always on hand to help with queries. Eurocell will also be showcasing some BIM case studies (no sign yet) to provide inspiration and know-how. “We know from talking to our customers that getting the right BIM models can sometimes be a frustrating and time-consuming experience,” said Eurocell Head of Marketing Chris Coxon. “The idea behind our BIM Centre was to make everything as hassle-free as possible, and to make sure that people always have access to the latest information.” At the launch of BIM Centre it contained nearly 40 models covering Eurocell’s two most popular ranges Modus and Eurologik; that number will be growing all the time as new models are added. The models are in RFA or Revit Family format, requiring Autodesk Revit software. The use of BIM – a 3D model with information attached to its various elements – is gaining traction across most construction sectors in the UK. This has been driven by the 2011 Government mandate that central government departments should require BIM Level 2 on all its projects from April this year with ongoing funding to push onto Level 3. The goal for the implementation of BIM is that all the organisations involved in the design, creation and operation of a building or piece of infrastructure gain better understanding of the lifetime cost and performance of the asset and its elements. This should enable better decision- making and ultimately deliver better value.